The Reminisce 3 Drawer Nightstand by Yutzy's Woodworking at Dunk & Bright Furniture in the Syracuse, Utica, Binghamton area. Product availability may vary. Contact us for the most current availability on this product. Reminisce Collection with its distinctive profiles, round drawer fronts and nostalgic nature evoke a sentimental longing for the "good old days". Recalls warm memories of homecomings to Grandma's house. With the use of Wormy Maple our new "Keepsake" (a distressed, dry, low sheen finish) offers casual, unassuming charm and lets the unique character of each board shine through. 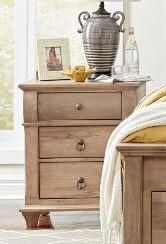 Reminisce offers many options for storage: dressers, armories, door chests, etc., all come standard with full extension, soft close, under mount drawer slides. And, updated for today's homes, the Arch Panel bed and the Iron bed are available with footboard drawers or side rail drawers - customize your storage to suite your needs. And, like all Urban Collection by Yutzy Woodworking furniture, we offer wood, finish, and hardware choices to reflect your personal tastes. How we can customize each piece to meet your specific needs? The Reminisce collection is a great option if you are looking for furniture in the Syracuse, Utica, Binghamton area. Browse other items in the Reminisce collection from Dunk & Bright Furniture in the Syracuse, Utica, Binghamton area.